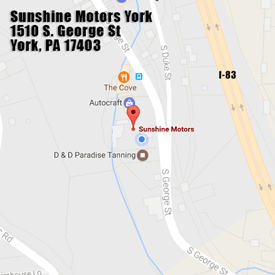 Sunshine Motors offers a warranty on all cars which includes the engine, transmission and 4x4 (if included) the entire time you are paying on it. Your vehicle also comes with a maintenance package which includes an oil change, checking and topping off all fluids (except gas) and inspecting the brakes & exhaust. This takes place at 1510 South George Street and should be done every 4,000 miles or 4 months. The warranty and maintenance package is included in your weekly, biweekly or monthly payment. All vehicles are inspected and emission tested at the time of purchase.